Experience the comfort of a vacation home with the amenities of a high-end resort and enjoy it all with your favorite four legged friend. Pet friendly timeshares are great options for those wanting to travel with their pet without sacrificing a quality vacation. Located within popular brands like Marriott and Westgate, these accommodations will be sure to please, offering kitchens, updated decor and furnishings, and a variety of great activities for dog and owner. Visit SellMyTimeshareNow.com for affordable rentals, or to purchase a pet friendly unit and enjoy annual vacations with your best buddy. Looking for rental units that will accept your four-legged friends. Our Jocelyn Manor condos and our Parrot Isle townhouses in Ocean City, MD gladly accept well-behaved dogs. What's more, there are no extra pet fees for up to two dogs. Do you love spending time with your dog? Does a vacation in the beautiful Adirondack mountains surrounded by dogs and dog lovers sound like your idea of fun? If so, you’ll love Canine Camp Getaway of NY! Held at the Roaring Brook Ranch in Lake George, NY, Canine Camp Getaway of NY offers a scenic paradise where you and your dog can be close to nature. 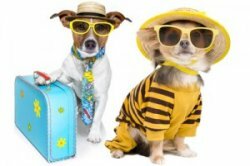 Thousands of pet friendly vacation rental properties worldwide. Rent direct from the owner and save. Most properties include photos. See before you rent. Luxurious log or rustic style cabins with water or mountain views. Always pet friendly, no pet deposits, size or weight limits. Sliding Rock Cabins provides a cushy pet bed, food and water bowls, all natural treats, toys, and beach towels. Spacious beachhouse comes fully equipped with pool table, piano and sandbox for you - doggy door, bed and bowl for your buddy! Michigan Lodging directory with pet-friendly cabins, cottages, vacation rentals and more.